JH Nunn has been supplying large Plastic Storage Containers, IBC Containers and Warehouse Pallets to the Warehouse and Distribution Industries for 30 years. 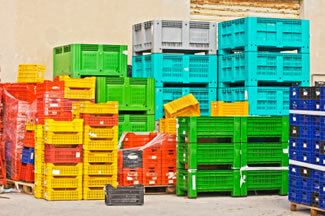 Our Large Plastic Storage Containers include Collapsible Bulk Containers and Fixed Wall Bulk Containers. These HDPE Structural Foam Containers are used extensively in the automotive industry for transportation, storage and as assembly line fixtures. In a closed loop system our large Plastic Storage Containers are very cost-efficient, because they will last 10 to 20 years even with rough handling and they are repairable. In Agriculture our Large Plastic Storage Containers are used as field bins for the collection, transportation and storage of a variety of fruits and vegetables. Some of our Containers are vented to extend the life of the produce they contain. Large Plastic Fixed Wall Storage Containers are used extensively in the fishing industry to hold fresh fish on fishing boats to keep them fresh until they can be brought to market. Molded of FDA approved HDPE material our Large Plastic Storage Containers are natural for Agriculture, Fisheries and Food Processing as their easy to clean surfaces insure sanitary containers for repeat use. The solid seamless construction offers a watertight interior perfect for holding pellets, powders and liquids. Other industries with requirements for our Fixed Wall Bulk Containers include Chemical, Resin and Textile industries. Even after years of use they will not warp, erode, splinter or rust. The IBC container is a transport vessel for transporting materials for the chemical and related industries. They require Containers that are both safe and economical. We carry 275 and 330 gallon sizes in reconditioned, rebottled and new. Rebottled and New IBC Containers are FDA certified to carry food products. Since they are easily cleaned they can be sterilized and reused hundreds of times. Our IBC Containers feature a HDPE extrusion blow molded inner container designed to insure complete discharge of contents. The outer container is a rigid welded galvanized tubular steel grid welded to a pressed galvanized steel base and a galvanized steel pallet. Our IBC Containers are UN certified for drop and pressure tests. Our Warehouse Pallets are used extensively for transportation, material handling and storage in a variety of warehouse applications. Our Warehouse Pallets have a 10 to 20 year life expectancy. They are most efficient when they can be repeatedly reused. 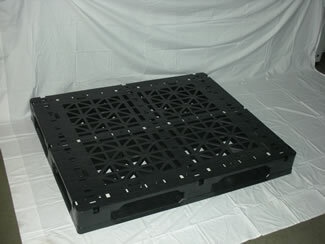 Warehouse Pallets are Nestable, Stackable and Rackable with dynamic load capacities ranging from 2,000 to 7,000 lbs. Racking load capacities range up to 3,500 lbs. Plastic Warehouse Pallets are very effective when used on assembly line conveyors because they all have consistent dimensions and are easily handled in robotic applications. Food and Drug companies especially like plastic pallets in their warehouses because HDPE is a closed cell Plastic which does not absorb mold, mildew, bacteria or dirt. The Standard warehouse pallet size is 40 "x 48", but we carry a variety of sizes up to the Beverage Can Pallet, which is 44"x 56". Warehouse pallets have applications in: Aerospace, Appliance, Automotive, Beverage, Chemical, Dairy, Electronic, Food, Industrial Distribution, Paper, Petroleum, Pharmaceutical and Retail Display Industries. JH Nunn Plastic Totes offer products and systems for materials handling in the Retail Trade, Food, Agriculture, Industrial Parts, Assembly Line Fixtures, and Conveyer Order Picking Containers. We offer Plastic Totes in Stackable, Nestable, Stack and Nest and Collapsible styles. 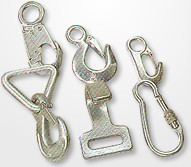 We carry a variety of sizes and carrying capacities ranging up to 70 lbs. We carry Injection Molded and Thermoformed styles in Polyethylene and Polypropylene that can include Lids. Contact JH Nunn to order the warehouse and distribution products you need, or for more information.